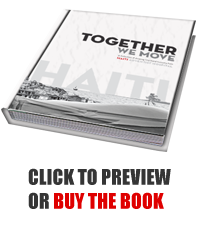 If you are looking to contact HAITI: Together We Move just use the contact form below. Remember to view our terms page to learn about order details on book purchases. Information involving shipping, returns, and general information can be found there. We appreciate your comments, feedback, testimonials, thoughts, and ideas. Thank you for your support. For mail submission and for fastest communication please utilize the form to the left and state the subject matter that best fits your requirement.